In an interview by Ferrari Magazine, Eric Clapton talks about the incredible process of designing his $4.75 million one-off SP12 EC custom Ferrari. When Ferrari unveiled Eric Clapton’s $4.75 million one-off SP12 EC in May, it was a site to behold for sure. 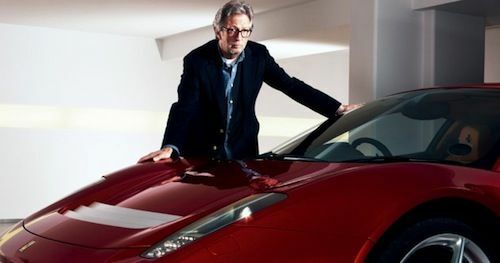 Before the official unveiling by Ferrari we heard rumors that Ferrari was building a new supercar for Clapton. The guitar legend worked with the Ferrari Style Center, Pininfarina and Maranello’s engineers in designing the multi-million dollar supercar. This was not his first rodeo as Clapton has owned a number of the expensive Italian sports cars, but this one would be the most special of all of them. This custom SP12 EC, (special project car, number 12, Eric Clapton) was designed and built to pay tribute to a car in which he crashed and was almost killed: the singers favorite 1970s Ferrari 512BB. He loved that car and it was featured on the cover of his "Slowhand" album. Clapton has owned three other Ferrari 512 BB’s and this new creation designed with the help of the Ferrari Style Center, took its inspiration from the 458 Italia. Not many people get to design and create their own Ferrari, but when Clapton was presented with the idea, he just couldn’t resist the rarest of opportunities. In the Ferrari Magazine interview, Clapton says, “When the idea was first presented to me, I thought, this is an opportunity that’s too good to miss. While this door is open I should get in there.” And he certainly jumped at the chance to work with Pininfarina and Maranello’s engineers in developing the custom masterpiece that eventually cost him $4.75 million. But as Clapton found out, this process of designing a supercar is “not for the faint-hearted.” In fact many people who has started the process with Ferrari, have not been able to finish and have backed off once they see how much work is involved. The freedom of designing a one-off car also will be too much for some and “blows their minds.” said Clapton. Ferrari Design Director Flavio Manzoni says the process is so involved and such an immersive experience, that “it’s like creating a concept car.” An indecisive individual would not do well, but the musician is a man who definitely knows what he likes. Clapton is well-known for his interest in fashion, art and design, so he was well-equipped for the rigors of designing the custom Ferrari SP12 EC. It must be a beautiful thing to be able to put a few dents in a one-off $4.75 million work of art. Eric Clapton has earned the right and paid a big price in time and money to be able to do it.